For the first time in 37 years and the second time in living memory, snow has fallen in the Sahara desert, which has been known for its brutal and suffocating heat. According to a media report, amateur photographer Karimm Bouchetata took pictures of the snow in the small Saharan desert town of Ain Sefra, Algeria on Dec. 19. “Everyone was stunned to see snow falling in the desert; it is such a rare occurrence. “It looked amazing as the snow settled on the sand,’’ Bouchetata told newsmen. 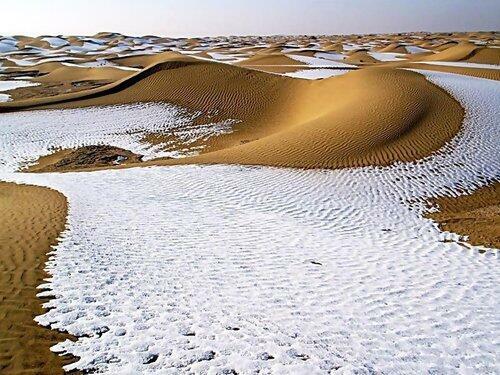 The last time the Saharan town saw snow was in 1979, when a half-hour snow storm reportedly stopped traffic. Founded in 1881 as a garrison town for the French, Ain Sefra is located in northwest Algeria and is known as “The Gateway to the Desert” with a population of nearly 35,000. With an altitude of over 1,078 meters, the town has a blistering hot summer climate, while in winter it could be very chilly. According to a media report, the temperature in the area was roughly 10 to 15 degrees colder than normal when the snow occurred.